Seeing vehicles from Uber and Lyft, the car-sharing services, cruising the streets of major American cities gets me excited about what could happen to the industry I serve – electric utilities – in this new sharing economy. Sharing has already disrupted – to the point of destruction – music, newspapers, and book-publishing. Now taxis and airport limos, among many other industries, are undergoing wrenching change. Due to Uber and Lyft, many old-line taxi companies can’t find enough drivers to fill their cabs. So what does this have to do with energy and electric utilities? Everything. 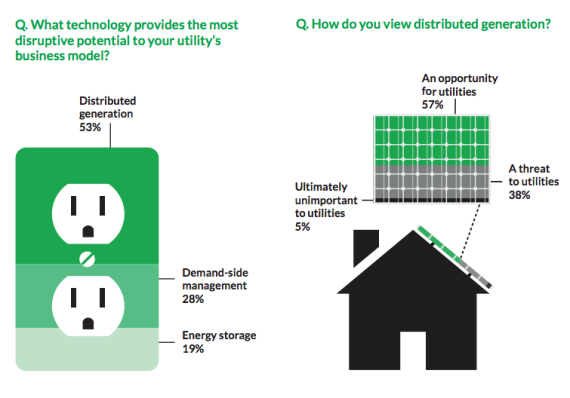 More is going to change in the utility industry in the next 10 years than in the last 100. That change will be for the better as shrewd utilities and government regulators innovate and advance the utility business model like the economy as a whole. The way utilities make money today is straightforward, but profoundly constrained: regulators determine allowable profits and utilities sell energy priced accordingly. Most utilities score solid marks for promoting green behavior with their energy conservation programs, but every kilowatt-hour that consumers conserve or generate themselves with renewables is a kilowatt-hour that the utility is not selling – a loss of revenue under our current model. Understandably, advances in renewables, storage and more capture our utilities’ attention as they must operate within our legacy business model. In an outdated system, every technical advance is a potential revenue threat. And for the savvy utility CEO, an opportunity. For example, some communities are currently sharing the cost and benefits of solar installations in so-called “solar gardens,” or forming energy cooperatives. Smart, energy-saving Internet-connected devices like the Nest thermostat system are proliferating. Tesla and eVgo, among others, are building national networks of electric vehicle charging stations independent of local utilities. Distributed power providers such as NRG Energy, which serves nearly 3 million customers in 16 states, is currently selling as well as conducting trials of highly efficient, sustainable solutions including solar power and combined heat and power units that are strong enough to power the average home. “Old school” utility companies themselves offer innovative services like Opower, helping consumers compare energy usage with their neighbors to highlight and target inefficiencies. These and other innovations represent a potential loss of revenue for utilities under the legacy model. Now the good news: these innovations might be threats under the old model, but they are opportunities for the innovative utility looking to expand its mandate, service offerings, and impact. With an intimate knowledge of the local grid, a fleet of trucks and the expertise to match, who else is better equipped to install and service household solar systems, electric vehicle charging stations, fuel cells, and more? Looking for more good news? Though such sharing-economy innovations as Uber and Lyft might threaten the taxi and limo industry, they still require that sophisticated infrastructure we call the streets. 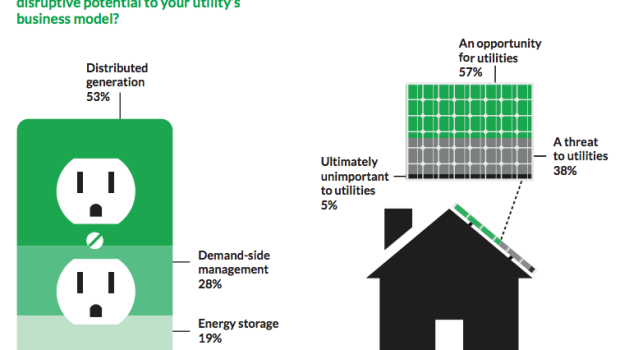 Utilities threatened by declining sales of kilowatt-hours are now wisely moving to reinvent themselves. They are moving beyond the current, outmoded, metered-taxi business model to become the equivalent of the streets and the skilled experts that service that invaluable infrastructure while offering new services. Without this infrastructure, nothing energy-related can happen. Those revenue-reducing examples – solar gardens, community energy coops, Tesla, EV charging stations, home fuel cells, Opower, and so on – most require connection to the grid at some point. Without the grid, the fundamental energy infrastructure, America is 313 million disconnected points of light. Where will our electric utilities fit in the sharing economy? Clearly, the current/legacy business model will move utilities toward the twilight struggle of record companies, newspapers, book stores, and the taxi industry. But the success of young sharing economy companies inspires utilities – and their regulators – to embrace the opportunities, selling not kilowatt-hours but value-added grid infrastructure services. In this way the industry will find itself at the very center of the future. It’s an exciting time to be in the energy business.